If you want a local Brooklyn wedding, but are tired of plain brick and cement venues in the city, consider the Brooklyn Botanical Garden. For over one hundred years, the Brooklyn Botanical Garden has served its mission. It hosts a million visitors annual to enjoy its thousands of flora varieties. It’s located in central Brooklyn, but once you’re within the gates, it feels as if you’re in another world. The historic Palm House and the contemporary Lillian and Amy Goldman Atrium both offer event spaces. There is plenty of glass to let in the natural light. It gives you the feeling of being in the middle of a fairytale garden. 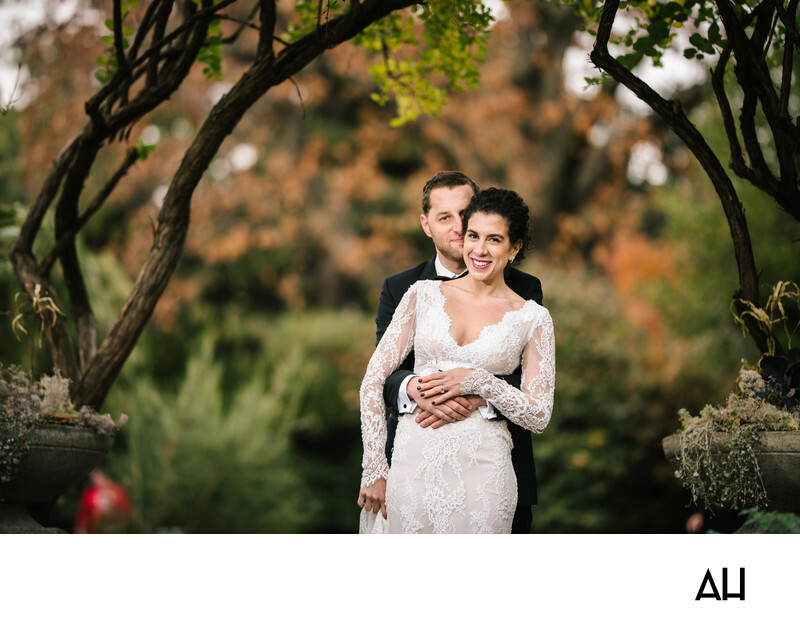 Hosting your wedding here will ensure you end up with terrific Brooklyn Botanical Garden wedding photos. As an experienced wedding photographer at this venue, I’ll take your portraits in the best hidden gems the gardens offer. Because of the wide variety in the gardens, we can capture the exact backdrop you’re looking for in your Brooklyn Botanical Garden wedding photos. Since the garden is a living place, it’s exact foliage varies through the seasons, from springtime tulips, to the flaming leaves of fall. But the garden makes an excellent venue all year round. There is never a lack of color or beauty – especially when I’m there with you to spot the best scenic shots. The Brooklyn Botanical Garden is also available for engagement and wedding portrait sessions. I encourage my couples to consider using a variety of settings for their photos so that you can have classic, timeless outdoor photos. Even if you’ve already chosen a venue for your ceremony and reception, you may want to think about using a different location for a separate wedding portrait session. If you have questions about booking a session please don’t hesitate to reach out. I love discussing beautiful potential venues with my couples.